2018 Honda CBR1000RR SP2. Picture credits - Honda. Submit more pictures. This limited-edition bike is designed for the most serious enthusiasts and professional racers. In addition to all the SP features, the SP2 uses a cylinder head with larger intake and exhaust valves, along with premium forged Marchesini wheels. Price as new (MSRP): US$ 24999. Prices depend on country, taxes, accessories, etc. Instruments: Full-screen LCD instrumentation includes a lap timer, trip and fuel-consumption computer, five-level customizable shift indicator, gear-position indicator, and peak-rpm memory function. Comments: Titanium Fuel Tank. Gyro-Assisted ABS. Model ID: Limited edition model. CBR1000S2. Ask questions Join the 18 Honda CBR1000RR SP2 discussion group or the general Honda discussion group. Get a list of related motorbikes before you buy this Honda. Inspect technical data. Look at photos. Read the riders' comments at the bike's discussion group. And check out the bike's reliability, repair costs, etc. 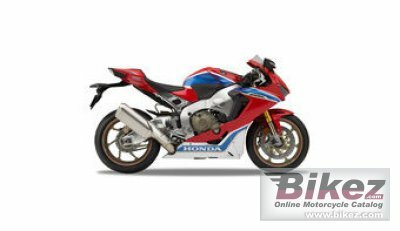 Show any 2018 Honda CBR1000RR SP2 for sale on our Bikez.biz Motorcycle Classifieds. You can also sign up for e-mail notification when such bikes are advertised in the future. And advertise your old MC for sale. Our efficient ads are free. You are also welcome to read and submit motorcycle reviews.